that will fill your room with nothing but the best quality of sound. So, what is a Surround Sound System? This set consists of five speakers, most of the time. For the purpose of this article, we have mainly focused on 5.1 kinds of sound systems, with an occasional 6 and 7. It consists of five speakers and subwoofer, including the fundamentally important “center speaker“. Other components include a Mixer and/or Equalizer, and Satellite Speakers. What to look for when buying a Wireless Surround Sound System? The most admirable part about shopping for a Sound System is the fact that it is wireless. No more annoying wires that crawl around your apartment or house but, much more free space. Other than that, there are a few more things to consider when shopping for the wireless sound system. The models we have reviewed are equipped with the Bluetooth technology with aptX or Wi-Fi, several models are equipped with both. Whether are you more fond of music or movies, you are looking for the warmest, crispest and the most powerful bass setup. However, the requirements of music and movies vary at its best. The subwoofer needs to be capable of producing the low-frequency, dynamic textures, while the speakers need to produce high-frequency sounds with warmth and crisp. Additionally, you should be looking for a surround system that can easily fit in the room and, considering that this is a surround system, you should keep in mind that the room will be large enough because there are products that can produce even too strong bass. Other important features are mentioned in the roundup below. If you are looking for a wireless surround sound system that delivers either the value and attractive look, Samsung HW-K950 is a dream choice. Being one of the best surround sound bars that we have laid our hands on, it carries a set of outstanding features including the dedicated back speakers that are delivering crispy and warm audio, suitable for either movies and music, while the subwoofer is powerful and dynamic compared to other systems. an aptX feature for enhanced connection quality and better sound quality. 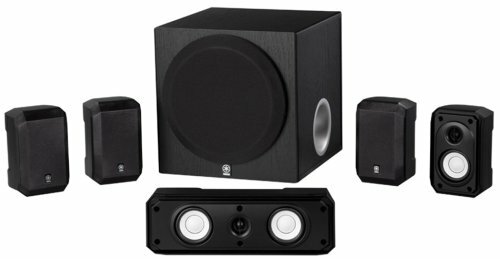 If you are looking for an easy buy, quality 5.1 wireless home theater system that won’t affect your pocket (budget), the Acoustic Audio aa5179 is the suitable candidate for you. Subwoofer Speaker: 6.7″ x 12.3″ x 13.1″. 5 Full Range Satellite Speakers: 4.1″ x 4.0″ x 6.7″. 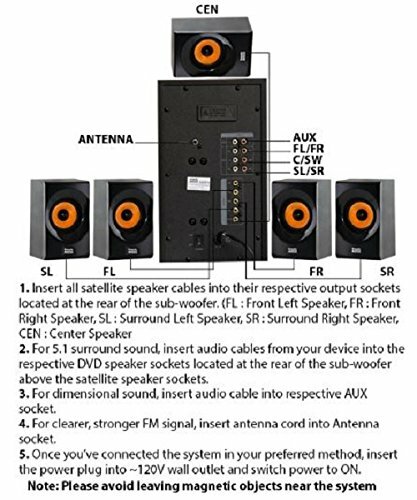 Fronts and 1 Center Satellite Speakers have a 6′ – Single RCA Cable. 2 Rear Speakers have 12′ Single RCA Cables. Bose featured the Acoustimass 6 speaker system that consists of a set of five compact but trendy and premium looking satellite speakers and a large subwoofer with a finish-matte design, that is covered with vinyl. it is easily adjustable and customizable. Unfortunately, the subwoofer takes a lot of space compared to other boxes from the competition so make sure that you have enough space. And the fact that it is a bit over-priced keeps the customers away. Either way, if you are looking for a tiny set of speakers that are capable of creating powerful and dynamic sound and have enough space for the chunky subwoofer, the Bose Acoustimass 6 is the right wireless surround sound system for you. 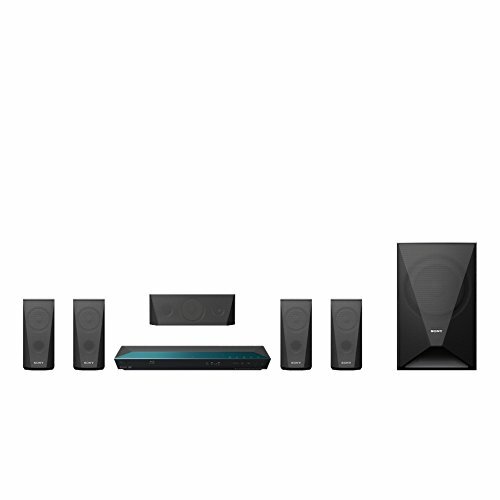 The VIZIO SB4051-C0 is a 5.1 system that consists of five speakers and a wireless subwoofer. There are the surround speakers and two satellite speakers positioned on the rear of the system. It features a compact design, which packs a lot of features, such as a Bluetooth connectivity with an imbued aptX for enhanced connectivity on phones and tablets. It has managed to fit the DTS and Dolby decoders which should satisfy the vast majority of buyers. The sound output is warm and premium so that every detail and special effect can be heard with the pure excellence. While the subwoofer produces an outstandingly high bass, it is perhaps too loud. So, it is important to buy with caution. Don’t buy unless you can place it in a large space. 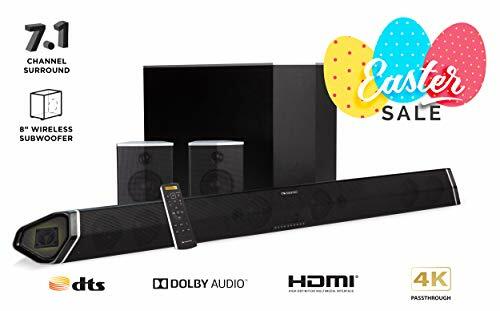 All in all the SB4051-C0 is a premium looking sound bar system that fits a lot of features in a compact design and possesses everything a powerful wireless surround sound system should have. Surprisingly, being a budget model, Yamaha YAS-203 came with a surprising amount of features, each one of them being original in its own way. Despite being the model that comes from late 2014, the YAS-203 has a powerful Bluetooth with aptX which enhances the sound quality and general connectivity. The sound bar is equipped with a decent number of different features, such as sound processing options. There is also an Air Surround Xtreme pseudo-surround processing, which will make sure that you are hearing the best of the audio output. There is also a Clear Voice feature which is quite helpful in case you are watching a quiet type of movies and need the dialogue to be cleared. Also, it sports a night mode feature which Yamaha decided to name UniVolume. 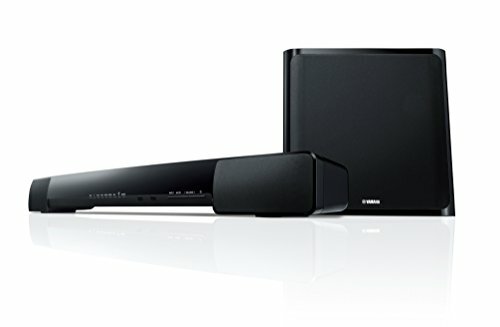 In terms of performance, Yamaha’s YAS-203 sound bar has proved quite handy and functional. The system is perfect for larger TVs, designed for 40 inches or bigger. It is equipped with a wireless subwoofer which produces dynamic and influential bass on low frequencies. 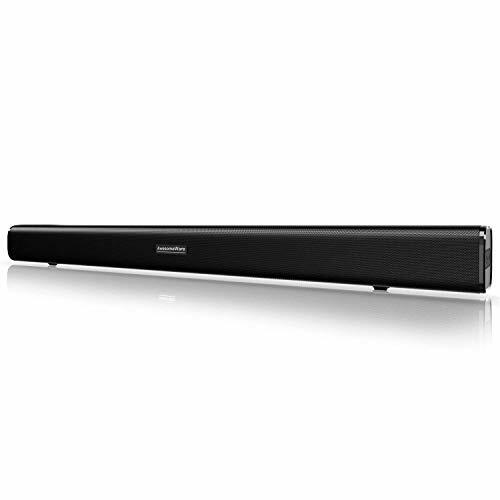 Although the connectivity is wired, the sound bar is also connectable with the Bluetooth and extremely easy to attach to the wall. Yamaha’s YAS-203 sound bar is a perfect wireless surround sound system that produces crisp, high-quality sound with a beasty bass. Whether are you a gamer, movie or a music lover, you will enjoy with every bit of this sound bar. Nakamichi promised the product that will take our breath away, and they succeeded with the Shockwave Pro. This surround sound system comes in an attractive and trendy design and stands for the somewhat budget-friendly system that will surround your apartment with crispy, warm and sharp audio and powerful, vigorous and dynamic bass. It focuses on details, even in the special effects that contribute to its powerful output. It consists of five sealed speaker chambers along with five DSP chipsets. It possesses the DSP EQ modes that will bring every game, every movie, and song to life. It also has an eight inches wireless subwoofer that conveys a ground-shaking, dynamic bass at only 35Hz frequency. This is a perfect surround system for large HD TVs, Smart TVs, 3D TVs that bring movies into life. It has various connectivity options including the HDMI port with a 4K Pass Thru, Analog Audio Input, optical Input, USB, and Bluetooth. The system is very customizable and easy to set up. This will vastly help people who don’t know their way with technology perfectly. Even connecting to the consoles is fairly easy, so if you are a gamer, you can enjoy with your friends and brag about the sound that matches pure excellence. We chose this system because of the low-frequency sounds Subwoofer that produces a strong bass that we could literally feel while testing, as the satellite speakers placed on the rear, produced a crispy sound matching the ones in the cinemas. If your budget ranges higher than the low-range but less than the $1000, this system will definitely suffice all of your audio needs. 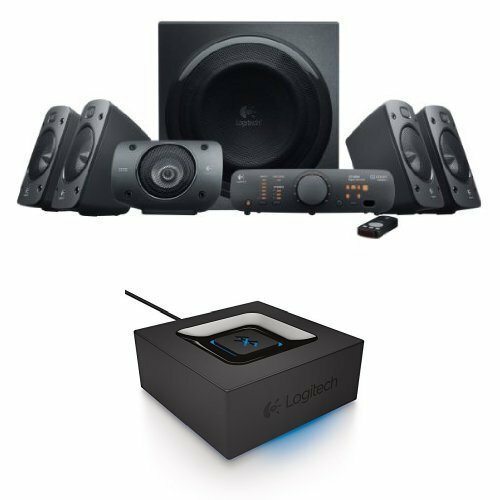 Logitech has featured an interesting system, the Z906 Surround Sound speaker bundle that is accompanied with the Bluetooth Audio Adapter. It consists of five speakers with digital surround sound. They were built with the THX cinema-quality sound in mind with 1000 watt peak power. These speakers are capable of being connected to up to six devices. With this setup, you will be capable of hearing every musical detail, in your DTS soundtracks and enjoy the musical experience it gives. The system consists of a couple of adapters which help it be as unique as it is. The system is connectable to other devices via the Bluetooth and it can stream the music from up to 15 meters. The system of speakers is also able to connect to any kind of PC speakers, stereo systems via the RCA or 3.5mm jacks. However, it doesn’t hurt to mention that this bundle is likely to be a receiver than a transmitter, meaning that it receives the audio from other devices but, doesn’t transmit it onto i.e. PC speakers. This is just another great choice for everyone who appreciates high-quality music, powerful, ground-shaking bass in the movies and games and is indeed a tremendous value. This is probably the best mid-ranged option, so don’t settle for anything less, and pursue the system that evokes emotions, and produces crystal clear sound that surrounds you from every corner. If you are looking for a surround sound system that will shine and feel premium in every possible way, then you are making no mistakes when pursuing the Sonos 5.1 Home Theater System. It comes with a lot of features that will enhance your overall experience with it. 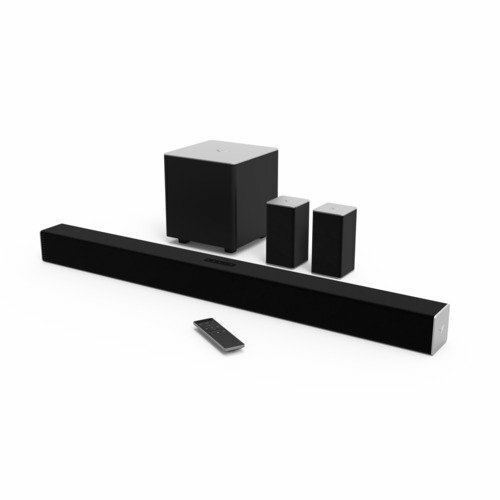 It is equipped with the Soundbar, Sub, and Play1, for ensuring that you are experiencing cinema at home. Before opting for this surround sound system, make sure that you have a place where you will place it. It is not built for decorating small bedrooms but large areas where it can shine. A Sonos Playbar is there to be attached to your TV in order to produce high-quality, warm and crispy sound, thanks to the nine amplified speaker drivers. Knowing that today’s most popular movies, TV shows, and series feature breath-taking soundtracks, the Playbar is there to ensure that no sound or hum go unnoticed, with the minimal distortion. The Sub feature has a wireless connectivity. Subs job is to deliver the low-frequency sounds. And, when you combine it with Playbar, you will get an amazing, crispy, outstanding quality of music. As a result of Subs low frequency, the Playbar can outshine in producing high-range sounds. With Sub, everything seems more dramatic, emotion-evoking and powerful, whether are you dealing with your music, movies or games. Furthermore, there are two of Play1 speakers that deliver accurate, warm and detailed music, allowing you to dive into the world you are exploring in your favorite games, resonate with the movie characters, or just relax to your favorite music artist. The most useful benefits of Sonos’ system as a surround sound system are its wireless connectivity that prevents the annoying dropdowns in music like it’s the case when the Bluetooth signal runs out of space, between your system and a mobile phone, ease of setting it up, and its versatility; All the speakers work together without interruptions even when they are set in other parts of your house or apartment. All in all, Sonos 5.1 Home Theater System is definitely worth having if you are looking to add more premium touch to your games and movies. The Yamaha NS-SP1800BL is a cheap and nice option for people who appreciate decent music. The unit consists of four Satellite speakers with a two-way acoustic suspension with 82dB sensitivity, along with the powerful center speaker that also garnishes a two-way acoustic sensation. All speakers have a magnetic shielding and produce crystal-clear, warm audio output, while the Bass leaves an outstanding performance, with little to no distortion. Additionally, the subwoofer has been imbued with the latest Yamaha’s technology called Advanced Yamaha Active Servo Technology (YST), which enhances the low-frequency bass audio reproduction. This system consists of common work of speaker and amplifier so that the impedance is canceled in order to achieve a flawless linear motion. The system is good with genuine listening to the music and watching movies. The speakers are also eligible for grille cloth removal but they may appear hard to setup. The subwoofer has the volume setting on its rear that you can adjust accordingly. Also, the system will be highly favorite by the gamer and the geek families who want to enjoy the cinema-class of their favorite action movies or evoke the sound powerful in-game worlds. The Vizio SmartCast SB3851 is an inexpensive option for all audio lovers who appreciate high-quality music. This budget-friendly option is perfect whether you are looking for the cinema like experience or, just enjoy the loud and crispy music. The system consists of five speakers, with an included satellite speaker and one wireless subwoofer for clearer and beasty bass, without those annoying wires set all over the place. Considering that it has five speakers, it is perfect for larger rooms, so that every corner of the room can be filled properly. The manufacturer promises a crystal- clear sound with a performance of 101 dB of room filling, along with barely existing harmonic distortion. The system is coming with a VIZIO smart Cast application, that allows being installed on your smartphone and/or tablet so that it can be used as a remote. The SmartCast feature allows you to use your favorite music applications to listen to your favorite music just a click away from you. The VIZIO SmartCast SB3851 has everything an ordinary, budget wireless surround sound system should have and it is a perfect buy for those that settle with the fair quality. 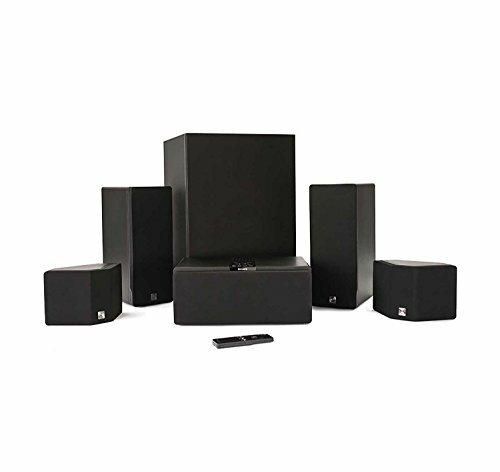 Enclave Audio CineHome HD is a 5.1 channel surround sound system that connects wirelessly via Bluetooth. The design is pretty straightforward, dyed in matte black. The wireless surround sound system supports the WiSa standard for the top-notch speakers to provide surrounding sound, heard and felt from every corner of your living room. The speakers are equipped with two drivers on opposite sound. That way, Enclave allowed the sound to have a full range necessary for watching movies, playing games or just listening to the music. The sound behind Enclave is crisp, detailed and accurate. The bass is punchy and dynamic. Still, the overall quality is far behind wired systems, regardless of the stability of the Bluetooth connection. Still, it is a sufficient quality for watching movies. The HDMI input ports allow you to connect a gaming console or a DVD-Blue Ray Player. All in all, Audio CineHome HD is nowhere near easy to afford. Still, its quality is a wonderful value when it comes to wireless standard. Pioneer HTP-074 offers all the comfort a listener to the high-quality music needs. To stream wirelessly, this surround sound system connects to the Bluetooth and allows you to connect your tablet, cellphone, laptop, or any other Bluetooth-supported device to stream music. Furthermore, it offers HDR support. It is important to note that one of these features includes the 3D eligibility to watch 3D movies with top-notch sound quality and play games. 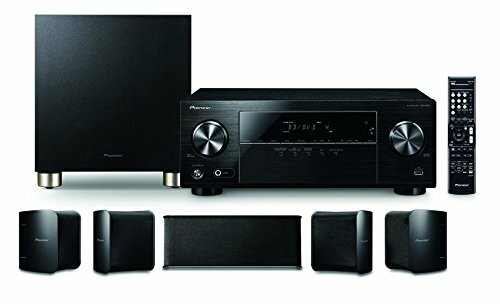 Pioneer HTP-074 supports the latest audio standards, which includes Dolby TrueHD, Dolby Digital Plus, and Dolby Pro Logic II. Regarding design, the speakers of this 5.1-channel systems are pretty compact. You can fit them anywhere from your TV table to bookshelves. The overall weight is 38 pounds, so compared to the competition, the users shouldn’t intercept any problems to transfer them to the room. Regarding performance, Pioneer HTTP-074 is everything a classic audiophile is looking for a surround sound system with wireless connectivity. The bass is punchy and dynamic. However, it could use some more strength. The harmonic distortion is minimal, which is good. The soundstage is wide if you listen to the music the power of vocals and instruments won’t go unnoticed. We only wish that the connectivity was stronger and more reliable, although this is a great system for users short on budget. Sony has always excelled whether it is wired or wireless home theater systems. The BDVE3100 model, in particular, makes it easy to watch movies, play games or enjoy the mesmerizing audio output in music form, thanks to the built-in Wi-Fi connection, that automatically connects to major worldwide networks such as Stream, Netflix, HuluPlus, Pandora and much more. It will allow the 1080p level of sound and excellent performance for those who are looking for an affordable way to enjoy music. The system also connects via Bluetooth devices easily and fast, allowing you to stream music from your cell phone. As mentioned, Sony BDVE3100 is a 5.1-channeled speaker system with extremely vast and powerful subwoofer of 7.1-inches height. The subwoofer works flawlessly, creating robust and accurate bass. The ground-shaking bass will appeal to movie and game lovers who like every effected to be pointed out. 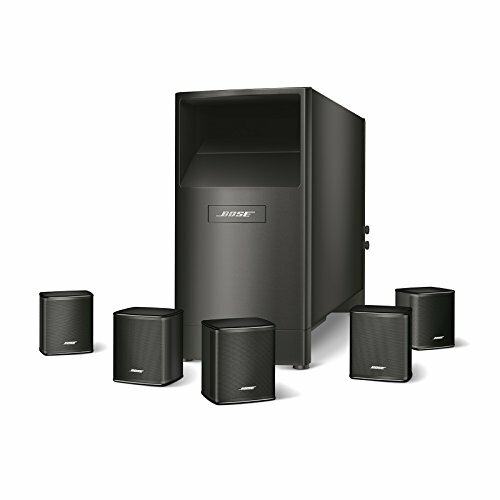 The sound performance is sufficient for a budget-friendly sound system. All speakers are synchronized and provide actual and stellar sound performance. 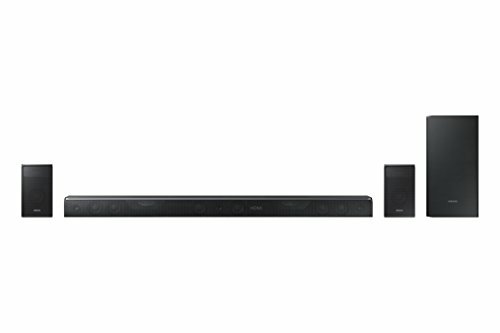 Next, to minimal issues, Sony BDVE3100 has sufficient performance for the budget-friendly speaker system. Notice: Updated at 1st January, 2019. Our compelling list contained ten sound bars that have marked their appearance in either budget friendliness, quality, and features. Once again, it is helpful to mention to not pursue the perfect wireless surround sound system unless you consider some factors that could be highly helpful when choosing the right sound bar. Either way, we do hope that this list was helpful and that it supports your decision on which wireless surround sound system to take.